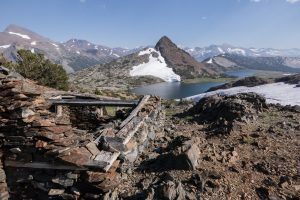 This trail starts at the high elevation Tioga Pass and climbs a ridge with sweeping views before descending to two beautiful lakes high in the alpine. With the high elevation and the trail’s steep grade, you may be stopping to catch your breath as you climb up through the trees. While there are small meadows along the way, the views don’t really begin to pop until you approach the top of the ridge. A few steep switchbacks bring you to the ridge below Gaylor Peak with stunning vistas in all directions. Dana Peak stands most prominent to the east. The rocky trail steeply descends to the lake so watch your footing. You’ll wrap around the north end of Middle Gaylor Lake which has the appearance of an infinity pool on the horizon. Keep an eye out in the rocks for American Pikas and other small mammals. The trail travels up alongside the beautiful inlet creek through an alpine wonderland full of Belding’s Ground Squirrels, with craggy peaks and wonderful geology all around. It doesn’t take long to reach Upper Gaylor Lake where you’ll traverse along its western shore with Gaylor Peak reflecting in its cool waters. Continue past the lake to remnants of an old cabin, the old mine, and excellent geology before heading back. Trailhead: Park at the parking lot just inside the Tioga Pass Entrance.